The competitive spirit that Dominick Conde brings to every one of his engagements has made him one of the United States’ preeminent patent litigators. For more than 25 years, it has fuelled his work on large-scale patent litigation, in which he often represents pharmaceutical clients in high-value Abbreviated New Drug Application matters. Those familiar with his work describe him as a “top pharma lawyer” who “completely stands out in terms of raw intelligence, lawyering skills and putting together the perfect case” (Chambers USA). In addition to serving as lead counsel in Hatch-Waxman litigation, Mr Conde regularly represents clients in contested proceedings before the US Patent and Trademark Office. He also frequently represents clients outside the pharmaceutical industry. The consistent thread in all of Mr Conde’s work – and the reason he is regularly recognised as one of the top IP litigators in the country – is his indefatigable will to achieve a favourable result for clients. This is why he is known not only as an “intellectual giant” (Best Lawyers), but as a “mature, pragmatic lawyer with great judgement” (IAM 250). 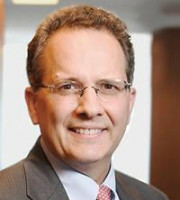 Mr Conde has spent his entire career in private practice at Fitzpatrick, Cella, Harper & Scinto. He previously served as the firm’s managing partner and sits on its management committee.